Notice: Welcome to the 2013-14 Academic Year! The staff in Student Services is excited to start another academic year! We planned a number of events for fall quarter including a chats with the Dean, a variety of career workshops and meet-the-firm events, as well as our traditional Halloween Open House. For our online students: watch for ways to attend these events online or listen to the recordings at a later date. Welcome our new staff member: Jason Boyd! Jason Boyd is our new MSIM/PhD Program Advisor. Jason will serve as the primary advisor for the MSIM and PhD students. A special thanks to Martez Mott who served as the student representatives on the search committees for this position. The iSchool is welcoming four new fulltime faculty members this fall. To avoid being escorted out of the iSchool labs when MGH is closed, you need to have an official permit issued by the iSchool. These permits will allow you to stay in MGH from building close to 3 a.m. No students should be in MGH between 3 a.m. and 7 a.m.
Building permits will be issued at the end of October to those students who request them. These permits are valid for the 2013-2014 academic year and expire on June 13, 2014. Permits must be requested each fall quarter. If you would like a building permit, please complete the survey at https://catalyst.uw.edu/webq/survey/carmenc/212149. Deadline to request a permit is Friday, October 30. MGH is closed on holidays and has shorter hours during quarterly breaks. The iSchool has several spaces available for iSchool students’ use. The iLounge (MGH 424), Computer Lab (MGH 440), and (when not being used for classes) the Classroom Lab (MGH 430) are available iSchool for students to use to support your academic activities. These spaces are accessed with your husky card. The expectations of the iSchool are that these environments be welcoming and comfortable for ALL iSchool students. iLounge Norms: This space is open to use by all iSchool students, staff and faculty as well as the custodial staff of Mary Gates Hall. The kitchen space is shared and each individual user is responsible to clean-up after himself or herself. This includes dishes, microwave, table tops, countertops and the fridge. Once a quarter, members of various iSchool student organizations do a general cleaning of this space. Behavior in both the computer labs and the iLounge is governed by the UW Student Conduct Code. Additional information about conduct expectations may be found at http://ischool.uw.edu/current/policies. Problems Accessing an iSchool Space? If your Husky card is not working in the computer lab or iLounge, contact the iSchool facilities manager Carmen Cook at carmenc@uw.edu. As a reminder, our primary mode of communication to iSchool Students regarding academic issues is by email to your UW email account. It is your responsibility to be aware of the information we send to your official UW email address. In addition to email, Student Services uses a number of other communication mediums to manage the various types of announcements we are asked to forward to students. 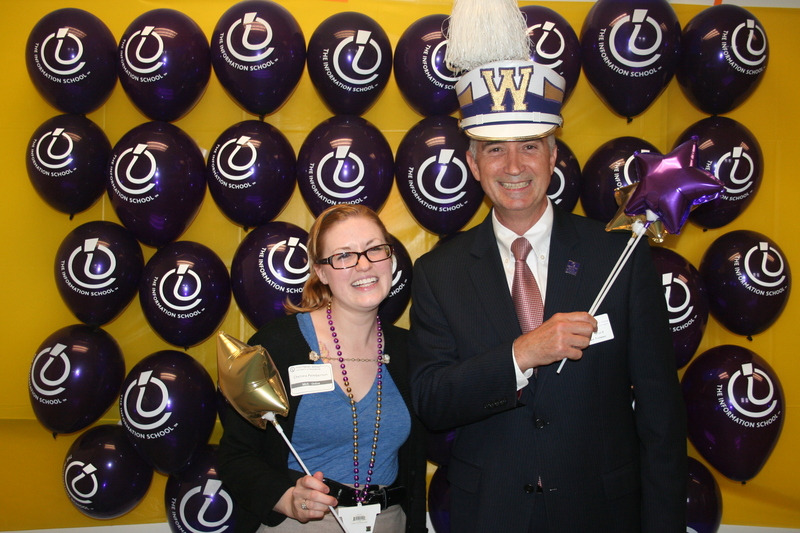 Announcements about UW activities, professional events or other opportunities for students that aren’t directly related to your academic program are posted on the Student Services blog. In addition to the blog, we also have a Facebook page as well as a twitter account. Have quick advising question? Send it to one of our advising emails. Looking for ways to get involved in the Information School? The iSchool is seeking student representation for the following iSchool committees: Academics Council, Diversity, Facilities and Research. As a committee member, you will be responsible for attending committee meetings to represent the student perspective, participating in committee activities and reporting pertinent committee topics to the iSchool Student Community. In addition, you will be asked to attend periodic Student Leadership Council meetings to update them on the work of the committee you represent. Serving on the committee is a great way to learn about what is happening in the iSchool as well as work closely with members of the iSchool faculty, staff and administration. Student Representatives are selected by the Student Leadership Council. The deadline to submit your application is Sunday, October 13, 11:59 p.m. The application can be found at https://catalyst.uw.edu/webq/survey/ioss/213042. More details about what these various committees do and, if available, when they meet are included in the survey. Presenting at a Professional Conference? The iSchool has funding available to help subsidize the cost for MLIS, MSIM and INFO students presenting at a conference. These funds are requested through your academic adviser. More information is available on the iSchool website at http://ischool.uw.edu/current/scholarship-funding. Space is limited for both events. If you’d like to participate, send an RSVP to jaysonc@uw.edu. Save the date—Thursday, October 31, 1:30 – 3:30 pm, MGH 470. Costumes welcome. Get your resume reviewed by the iSchool Career Services Advisor before this fall’s career fairs! Sign up for a 15 minute slot in iCareers. Meet with the PwC recruiting team to learn about technical advisory positions with PwC. Come to a workshop by Vic Snyder of the UW Career Center to guarantee your career fair success. This 5 week program helps international students prepare for their US job and internship search. The iSchool’s 3rd annual Don’t Be Awkward Networking workshop will teach you to prepare an elevator pitch and talk professionally in any setting. What is business casual dress? Learn about the details here. Drop in for office hours with Cisco recruiters to learn more about the company. Looking for some iSchool Swag? You’ll find it on Café Press. Funds from this site help to support student organizations. If you’re looking for something with an iSchool logo and you don’t see it here, contact a club officer and ask them to add it.